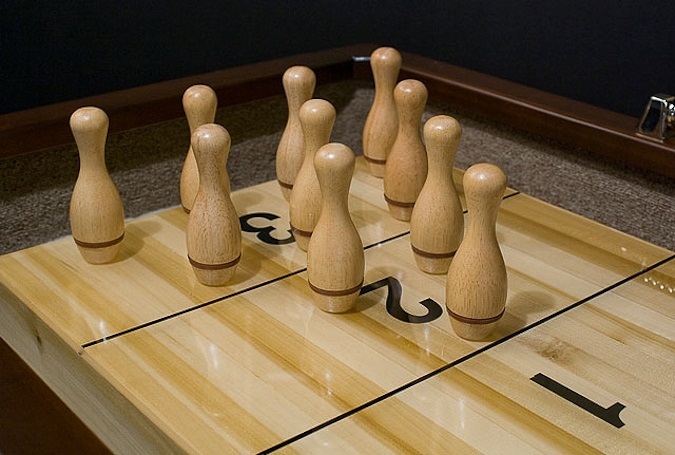 The game of “Knock Off” is likely the most popular shuffleboard play variation, and it can be played in singles (one vs. one) or doubles (two vs. two). In a doubles game, one member from each team will stand on each of the sides. The aim of the game is to reach, or surpass, a score of 15 points. Before the game begins, players must flip a coin to pick their colors, as well as the color of the “hammer.” The winner can choose whichever color they’d like, but the color which is elected to be the “hammer” will be the color which initially goes second. Once the final frame has been reached, the team with the hammer will be the last team to play. How to get Kids to Put Down their Phones: Shuffleboard! Have you ever seen a room full of kids sitting together, but not interacting, because they are all on their phones? 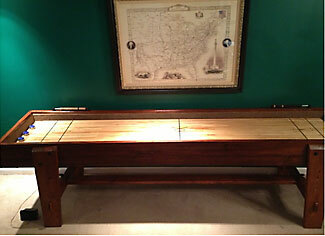 A shuffleboard will act like a magnet to get them up and playing together. The game encourages social interaction, team strategizing, and instantly creates a fun atmosphere. What’s more, the game will foster relationships between young and old, since all ages can play the game. When they first play shuffleboard, the inclination of most children is to whack the puck as hard as possible. They quickly learn that, in order to keep the puck from falling off the edge, so they can win the game, they must rein in their energy. The game of shuffleboard helps them to finesse movements, develop precision, and ultimately improves eye-hand coordination. 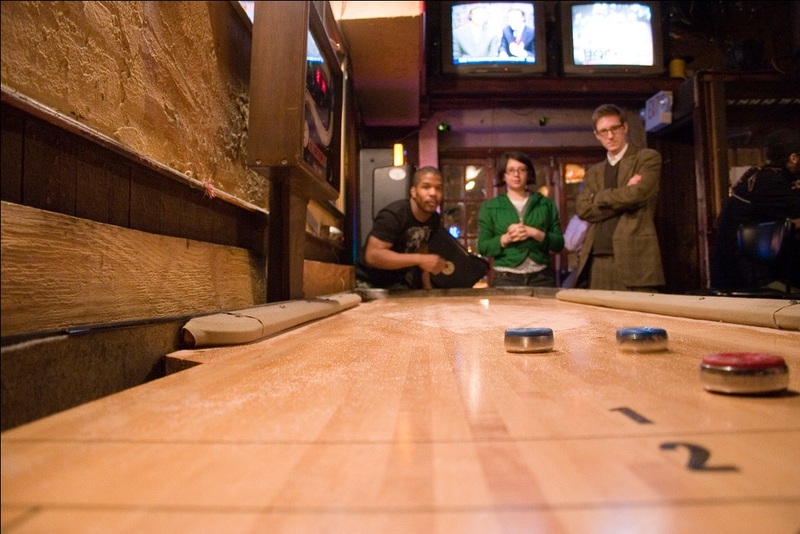 In table shuffleboard, there are a wide variety of techniques and strategies that can be used to stifle your opponent. Today, we’re going to show you a list of the most popular shuffleboard shots with the goal of adding a few new throws in your bag of tricks. Dutch shuffleboard, also known as Sjoelbak or Sjoelen, is a variation of table shuffleboard that has been influenced by games such as bagatelle, pinball, billiards, skeeball, and miniature golf. Yes, it’s a very rich game that pulls together pieces of many popular home recreation games. Unlike normal table shuffleboard, Dutch Shuffleboard is played on a unidirectional board meaning you only shoot in one direction as opposed to two. 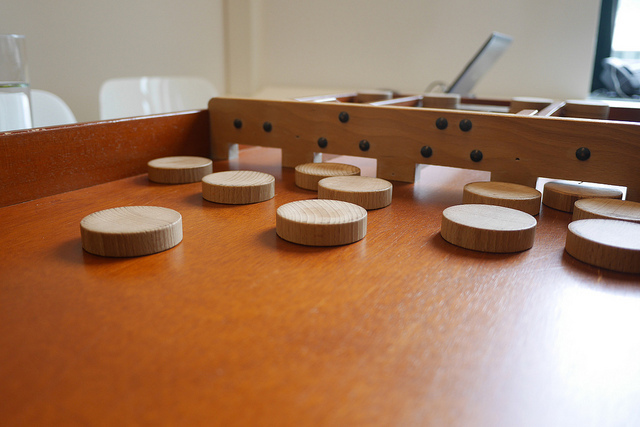 The ultimate goal of Sjoelen is to throw your discs through small slots on the other side of the table. Instead of landing in scoring zones like you would in normal shuffleboard, you have to shoot your weight into one of 4 scoring boxes. Each box has a certain value. In this sense, you might even say it has a little bit of Plinko involved too! Sjoelen is a popular game in the Netherlands, Belgium, and Germany although there are some here in the states who enjoy the game. There are two types of Sjoelen; Homas and Schilite. The boards are the same but the gates and discs are a different size. Sjoelen board is 2 meters x 0.4 meters with 5.2 centimeter walls on 3 sides. The rail guide shot or the “finger rail shot” is one of the most fundamental shots that every shuffleboard player should have in their bag of tricks. 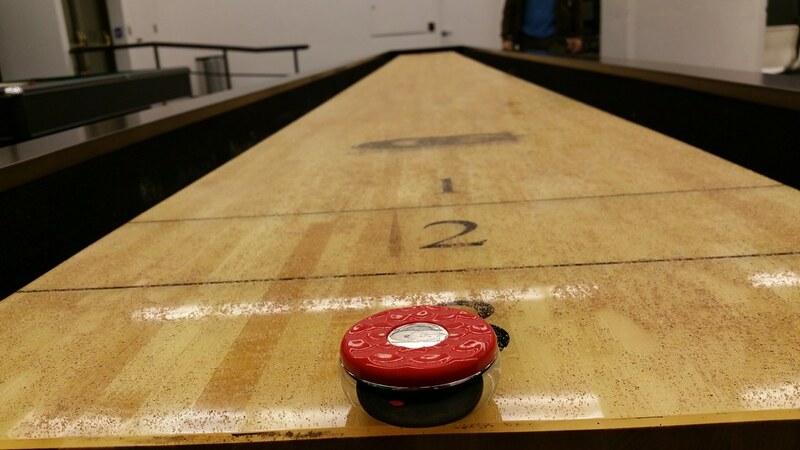 The finger rail shot allows you to use the edge of the shuffleboard table to guide your shot. Shuffleboard wax is categorized using a numeric speed rating system. A wax rating of 1 is the slowest while a rating of 3 will create a slick surface and faster playing speeds. 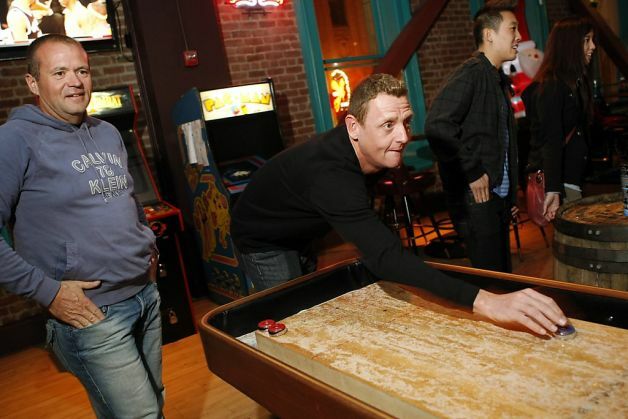 Waxing your shuffleboard is essential to creating an ideal playing field. Although your shuffleboard table has a finish that is naturally smooth, playing without shuffleboard wax will wear out your table much quicker. Shuffleboard wax has been given many names. 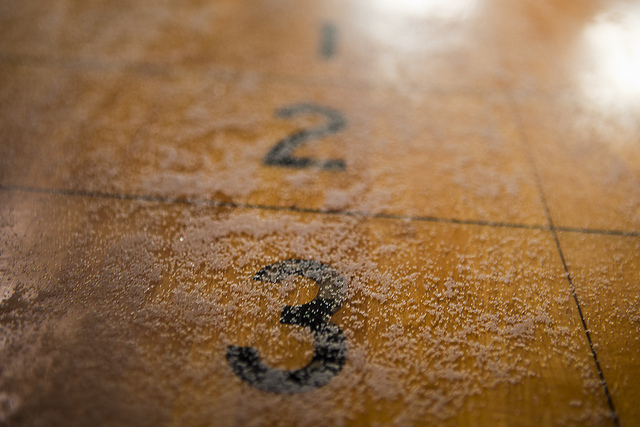 You may have heard it called shuffleboard powder, dust, sand, sawdust, salt, powder, silicone, etc. Those who are emotionally attached sprinkle on a magical pinch of fairy dust. 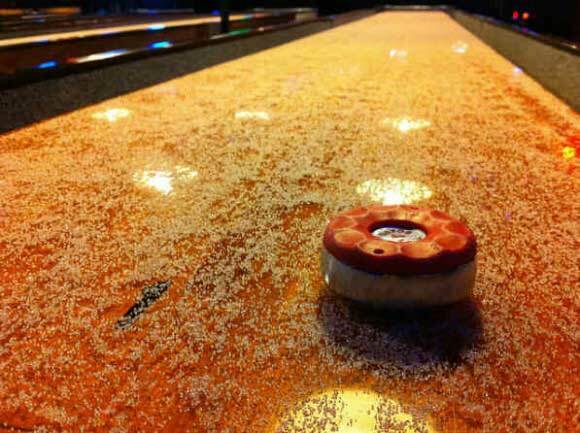 Whatever you call it, shuffleboard wax will improve your game and help you look like you’ve played before. If you’re still a rookie, no problem. 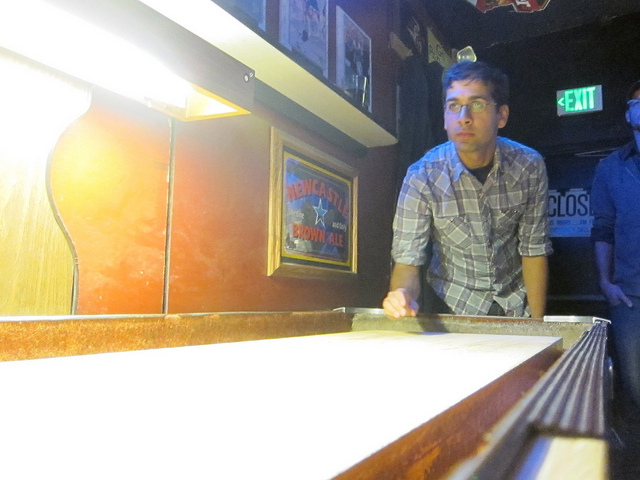 Start by reading these basic shuffleboard pointers so you don’t look like one! Bowling Shuffleboard – What is it and How Do You Play? Shuffleboard bowling is a very simple game that is straight-forward and tons of fun. It’s less intensive than traditional bowling that may be a bit too strenuous for some ladies. Bowling shuffleboard is much easier but equally challenging, requiring more skill than pure brute strength. Shuffleboard bowling will keep you interested while building strength, accuracy, and hand-eye coordination. 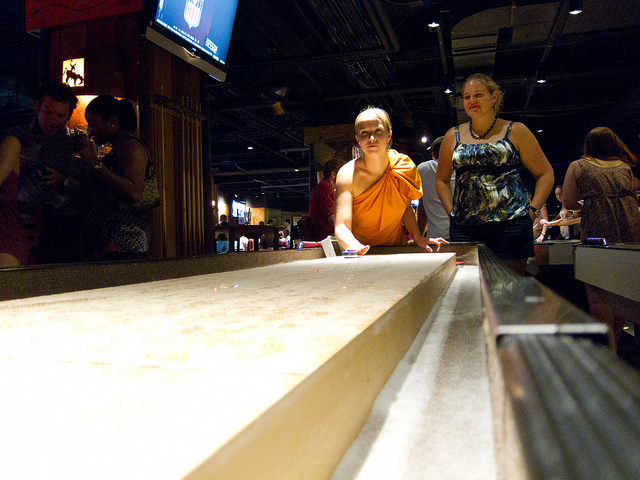 Unlike traditional shuffleboard competitions, you can add as many players as you want. Bring on the party! You can print out the bowling scorecard below to keep track of the score and keep things from getting messy.